I would be wrong of me to open this weeks article with anything not linked to the incredibly dry weather we have been experiencing recently. And, while it may have come as a nice surprise for early season cricketers (although Newton’s square already looks like mid August) and has brought a potentially bumper crop of pears to my trees, it is having a massive impact in the countryside. Last week fire tenders, and staff support from Clinton Devon Estates and RSPB fought a fire which had broke out on Aylesbeare Common and the neighbouring Hawkerland Common. 60 firefighters battled the flames which at times towered over their heads, as this precious heathland was saved. Late summer fires are a serious problem for the heaths, but in many respects the species have evolved to cope with this natural phenomenon, what makes May’s fires particularly disasterous is that is occurred during the nesting season and any birds caught in the blaze will have perished. The notable bird species for East Devon’s heathlands, the rare Dartford Warbler, was already having a torrid time of it in 2011, after two successive cold winters were seen to be taking their toll on the population. This outbreak could well have added another obstacle in their recovery. After periods of prolonged dry weather, much of the countryside becomes tinder dry, but particularly heathland. Fires can start through natural processes, however most are caased by people’s negligence or malign intent. If you are out walking or picnicing on the commons this Spring, please be aware of the increased fire risks and do all you can to minimise the chances of accidentally starting a fire. I don’t want to discourage anyone from visiting, as the more people who are there to enjoy the heath, the more pairs of protectie eyes are on site to look out for any lowlife who may intend to start a fire deliberately. Fire Officers commented that the blaze on Aylesbeare seemed suspicious as there were two centres to the fire, one hundred metres apart. Wildlife is feeling the pinch at sites across the region due to the dry weather, and many wildlife charities are asking people to leave shallow dishes of water in their gardens for the likes of hedgehogs and garden birds. A report of a ring ouzel visiting a garden in Sheffield to drink from a bird bath, should be encouragement enough for all of us to pop a few dishes in the garden! Species reliant on standing water may also be in jeopardy if the dry weather continues, as pond levels fall. Most of the species which have adapted to live in ponds are fully amphibious in one way or another, meaning that they are able to easily move from one pond to the next as water levels naturally fluctuate. In the summer, for example, it is common to have water boatmen fall into dry metal dishes left out in the sun, as they are mistaken for open water by the insects as they fly overhead. Indeed, due to the very wet nature of Devon, one species of newt is particularly rare. Our wet climate means that most of our ponds remain full of water throughout the year. The Great Crested Newt, which is the rarest species to be found in the UK, specialises in inhabiting ponds which seasonally dry up in the summer, making them less inviting for competitors in the newt’s niche. Devon’s ponds seldom dry out, and so there are only a very few places in the county where you can find these warty giants. Dragonflies are bound to water for most of their lives, as they spend the vast proportion of their time underneath it as nymphs. While an adult dragonfly may be on the wing for a month or six weeks, it could have spent up to three or even four years underwater in it development. Really, we should call them Dragonswims. 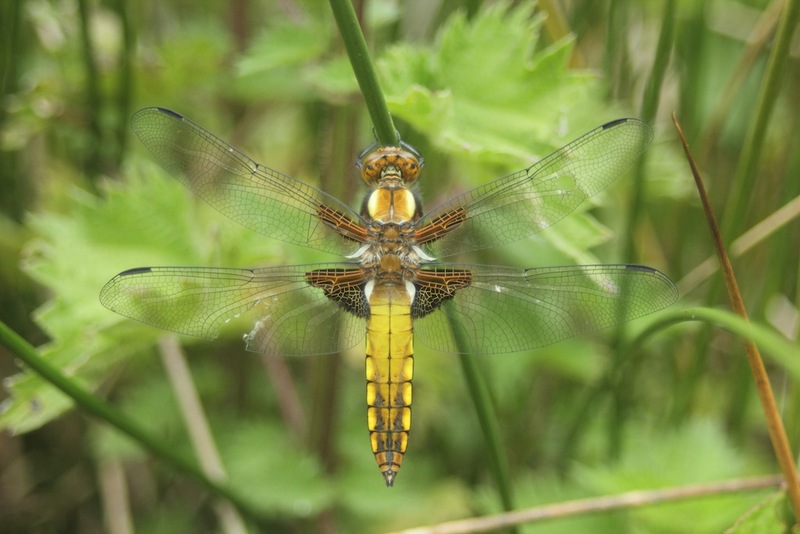 This broad bodied chaser was found by a group of us on Stafford Marsh last week, during an wetlands visit by Exeter University. We were meant to be carrying out a small mammal survey but, as is often the case, any impressive animal stumbled upon sparked conversation! The bright golden hue of this individual means it is a young adult, known as a teneral. As soon as the adults have crawled out of the water and emerged from their nymphal skin, they fly away from the competitive water’s edge to spend few days building the strength to defend a section of the reproductive pond. If you look closely at this individual, you can see evidence of how dangerous life by the pool is, as the lower wing on the left hand side shows signs of damage already incurred. This individual could still potentially build up the strength to return to the pond, however if the wing damage affects his flight ability too much, he will not be able to match the other ariel acrobats above the water and will probably not breed successfully. The weather has such a profound impact on our lives, us Brits talk of little else when making small talk. However, for those animals and plants which are not tended by a human overseer, the weather is an all-together more mortal concern. 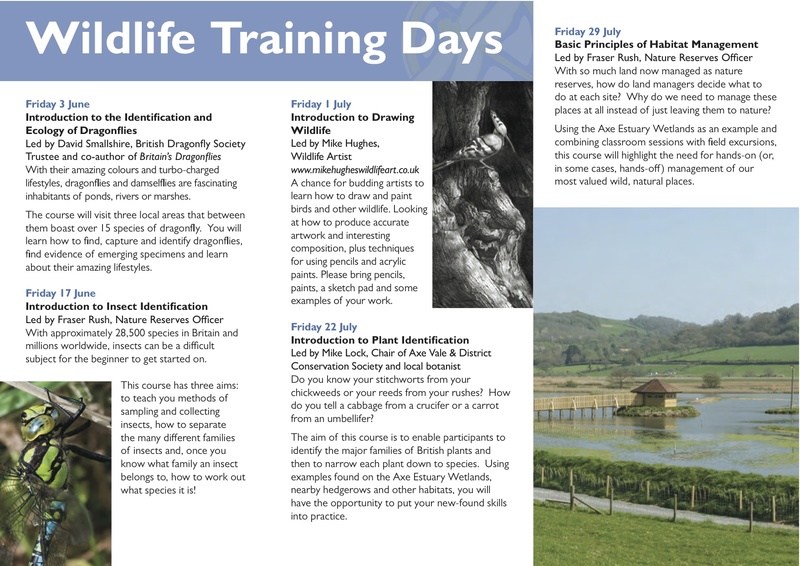 Make the most of a bargain offer – book a wildlife training day before the 31st May for only £20 – a saving of £15! 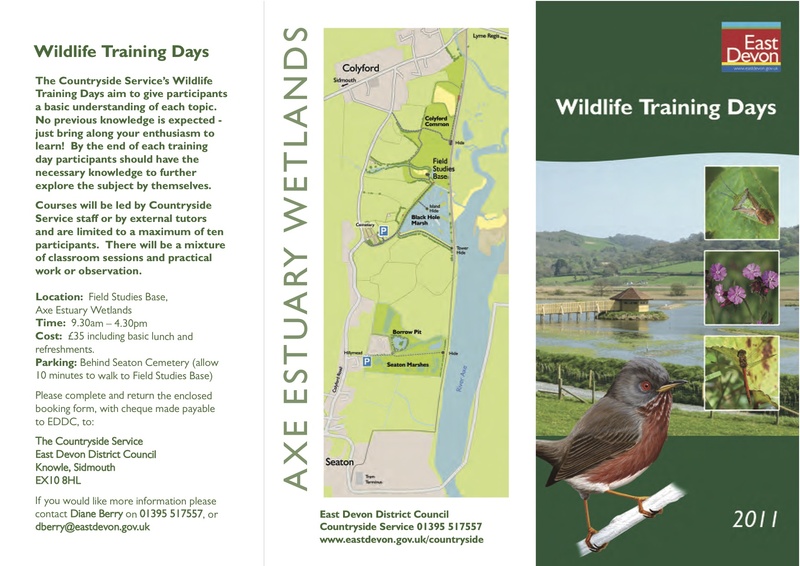 Download the Wildlife training leaflet as a PDF. For more information call the East Devon District Council Countryside Service on 01395 517557. There’s nothing more frustrating than spending almost an entire day on a nature reserve, only to find the exciting rarity turns up just as you settle down for a meeting a few miles away. That’s what happened to me yesterday, and I’m not sure how I managed to stop the steam coming out of my ears! For the most part, Tuesday was spent meeting-and-greeting at a day of mammal activities held on Stafford Marsh, part of the Axe Estuary Wetlands. I was stationed at the newly created Field Studies Base and helped welcome people to the event and direct them on the mammal-trapping action or get them started on treasure hunts or print making in clay. A simple, but simply divine reason to be out of the office on what was possibly the most fabulous day of spring so far. Tadpoles were massing on the fringes of the pond in Stafford Marsh, one of the few places on the wetlands where these thin-skinned amphibians can thrive. Frogs are not tolerant of salty water and most of the ditches and the borrow pit on Seaton Marshes are too brackish for them to survive. But they more than make up for it in this small pool. The mid afternoon sun shone through water the colour of weak tea, illuminating the little tadpoles as they propelled themselves along furiously with their tail. On the large, soon-to-be, reedbeds which hug the Field Studies Base, a family group of mallards were engaged in the complicated process of raising their ducklings. The parent ducks were being continually disturbed by an interloping male who seemed very interested in the female, and while the male duck was valiantly chasing off the intruder, the twelve ducklings dashed about over the surface of the pond. Floating high in the water, the little ducklings normal bobbing speed was interspersed with short bursts of over-drive as they spotted a small fly buzzing over the water’s surface and set off in pursuit. With twelve inquisitive babies buzzing about, and the adult’s attention distracted elsewhere, it won’t be too long before the number of little fuzzy ducks appearing from the reeds each morning will surely decline! The unseasonal weather was more like a late May afternoon than mid April and this illusion was maintained with the sighting of a newly emerged broad-bodied chaser. These dragonflies are often the first of the local large dragonflies to appear, but this pale yellow individual was more than two weeks early and will be doing well to survive until the rest crawl out of ponds and begin to breed. When dragonflies first emerge from the water, crawl up plant stems and break out of their nymphal skins, they fly off as drab yellow or brown versions of the adult, known as a teneral. These can almost be thought of as an adolescent version of the full adult, in need to feeding up and building their strength before attempting to secure a mate. This development takes place away from the fiercely competitive water’s edge, where they could be attacked by stronger dragonflies that have already begun to claim territories over the pond. It is only when the full adult colour has filled the abdomen, and the all-important flight muscles are operating with maximum strength, that a dragonfly will return to the pond and look for a female. So the afternoon was one of those sun-kissed golden moments in the diary when the stars align and everything seems perfect. Don’t get me wrong, these moments are few and far between and more than outweighed by the times I am found rockpooling in a Barbour jacket shrouded in persistent drizzle on an August afternoon! Ahhh! I was looking down the barrel of 90 minutes shut in the Town Hall, knowing that a bird of mesmeric beauty, which I have only ever seen in the Mediterranean, was five-minutes jog away. Ever the professional, I kept a poker face and maintained my composure throughout the meeting. As soon as I could, I jumped back in the car and dashed to the bird hide. There were four others in there enjoying the view, and their smiling faces let me know that I had not arrived too late! I spent the rest of the evening enjoying the spectacle of a pure-white egret, the size of a heron, fishing in the Local Nature Reserve lagoon. A grey heron flew down to pester it; “you’re not from around here, are you?” seemed to be the inquiry, but the Great White Egret ignored its protestations and continued its feeding. These mighty birds are summer breeders along the western coast of France, but the site I remember seeing them most vividly is in the iconic Camargue. Set against a backdrop of massive salt marsh, speckled with black bulls and pink flamingos, these birds are a sight to behold. Alas, as much as it might have felt like it, I was in Seaton not Sete, and after briefly checking the reptile traps, I ventured home to recount my success. More Mediterranean rarity news, with the sighting of a Sardinian Warbler near the Geoneedle at Orcombe Point last week. At the time of writing it is not know if this black a white warbler with a bright red eye is still about, but it is a timely reminder that this is a cracking location for wildlife watching at this time of year. Set up on the red cliffs above the seafront, the hedges are alive with warblers, and the sea views offer tantalising glimpses of gannets, skuas and shearwaters. Perhaps you wouldn’t count yourself as a twitcher, prepared to travel many hundreds of miles to encounter a particular rarity, but everyone can find something of interest in this cliff-top perch, even if it’s just the beautiful maritime view. An interesting blend of old and new technology has recently been installed on the Maer Local Nature Reserve, to create more of an impact for visiting families. Some people may have seen the posts, logs and signs going in on the well loved site, and wondered what all the fuss was about, the answer is a long-overdue fulfillment of ambitions for this hugely important and little understood site. The Maer is probably best known as the area of municipal grassland which lies behind the Exmouth sand dunes, separated from the beach by the Queen’s Drive. The cricket club nestles in the north west corner, tennis courts and the BBQ area also sit neatly in the mix. The open grassland is a valued space for walking dogs, rigging kites and windsurf boards as well as families playing games. Since 2003 a strip along the southern boundary of the site has been designated as a Local Nature Reserve, due to its value for scarce plants and animals, which abound in the sandy soils. Strange plants, specialised to deal with the poor soil conditions and harsh dessert-like microclimate, grow in a grassland of incredible diversity. Sea Holly, a member of the carrot family of plants but sharing none of the external characteristics, grows here fringed by hares foot clover, small restharrow and Poa inferma a small but very rare member of the grass family. The insect life is pretty interesting too, with puss moth caterpillars feeding in the scrub and a host of solitary bees making their burrows in the warm loose sandy soil, including my favourite Dasypoda hirtipes a little brown bee which looks like it wears ginger jodhpurs! The trouble with all of this list of rarities, is that they are easily overlooked and for the most part only identifiable by botanical or entomological enthusiasts. Which, to my mind, means that this wild jewel in the crown of Exmouth’s seafront is not valued by most people as much as perhaps it should be. Out of sight, out of mind, as is so often the case. However, recent development in the area provided a little funding for the community site, and allowed East Devon District Council to work with local primary schools and the local Ward Members in designing a play area to bring these species to life. Phase one of the project was completed last Easter with the installation of the huge wooden beasties which have proved so popular in the subsequent months, however it was not until early this year that we were able to instruct Phase Two of the project to be rolled out working with those excellent chappies at DreamMachine Media. “Explore the Maer if you Dare!” is the challenge which rings out around the perimeter of the Nature Reserve, with one of 7 characters hinting about their whereabouts on the site on what are known as sizzler boards. Once the attention is grabbed by these bright, bold and colourful signs, each piece of play equipment in the children’s adventure area now has an information board to explain exactly how the species you are climbing, sliding or crawling on fits into the ecological web of the surrounding reserve. Rather than being mounted on boring old stakes, we’ve set them in large oak logs from a nearby estate, and these have themselves become part of the play experience. When families have exhausted themselves on the traditional play element of the Maer project, there comes the opportunity to interact with the Local Nature Reserve in a much more twenty-first century way. With smart phones becoming so common, it was high time to embrace the technology and provide an educational (shh – don’t tell the children) activity driven by a mobile phone. 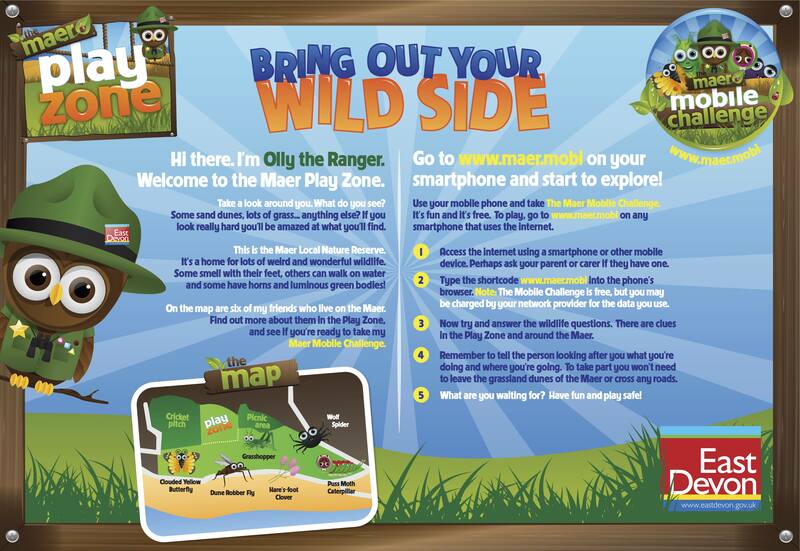 By logging on to www.maer.mobi from any computer or mobile phone, you open a short treasure hunt designed around the Nature Reserve, and its cartoon creations. All based firmly on fact, a series of questions are posed for the intrepid young treasure hunters as they navigate themselves across the site, to the zones marked out by the large posts. At each of these points, posers are set to be answered, and clues given as to how to find the playground critters in the flesh! So the reserve finds itself, hopefully, opening a new chapter in its existence and winning over another new audience to the charms and delights of this seaside space. If you’ve got children and haven’t been down to play or even if you haven’t got kids of your own, pop along on a sunny afternoon soon and give it a test run. The best bit about all of this, is that the increase in running feet, quizzical brows and exploring hands will only serve to benefit the wildlife of the Maer, which is always the over-riding ambition of Nature Reserve management. The increased footfall will help keep those wonderful bare patches of sand which are so important for the little ginger bees, and the new army of wildlife explorers familiar with the site will be an informed voice as to the value of wildlife in all of our experiences. One final thought; dogs are, and always will be, most welcome on this site, but please bear in mind the other users – especially little ones. It would be a lie to say that this site doesn’t have a problem with dog mess, and now my attention has moved off swings, signs and websites I will be attempting to address this issue with help from my colleagues at the District Council. Red bins surround this site, please pick it up and pop it in!